Slow cooker rice is my secret to getting dinner on the table with minimal fuss. Making rice in the slow cooker means you’ll have half of dinner ready without any effort! Save yourself the time slaving over the stove by making perfect rice in the slow cooker or crockpot. Where do you stand on the whole rice thing? 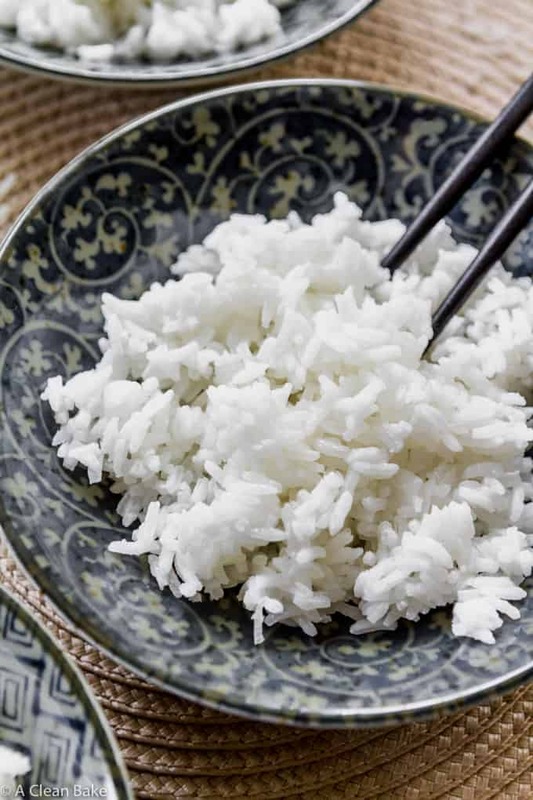 Are you a white rice fan, or a brown rice fan? Or, are you of the belief that all grains are the devil, and should be avoided? Me, I’m proud to have recently relocated to Camp Most Grains Are The Devil (from Camp All Grains Are The Devil) and my bunkmate in Camp MGATD has been white rice. I believe in eating whole grains over their “white” counterparts for the nutritional benefits, but only to a point. 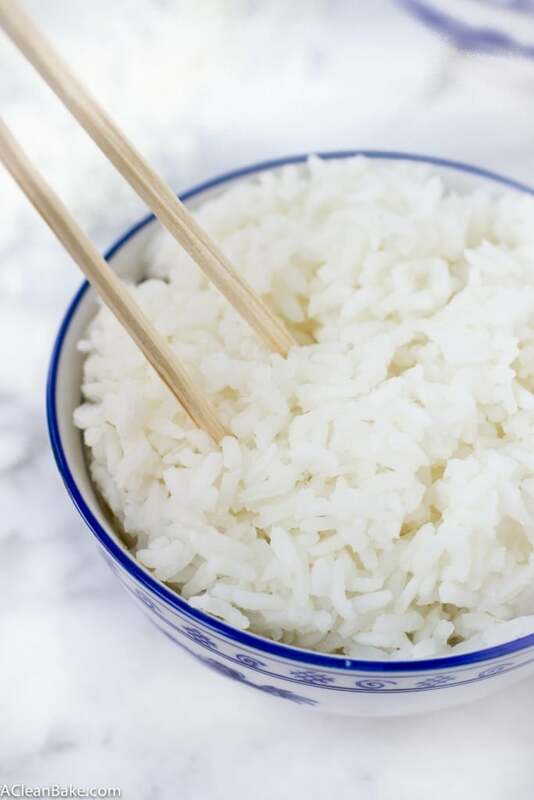 White rice may be higher glycemic (which means it makes your blood sugar rise and fall more rapidly), but it is also much easier to digest – as grains go – than brown rice (which, for me, is still pretty tough to stomach), and I love (LOVE) sushi. So, though I still eat a fairly low carb, paleo-friendly* diet, when I need a major (gluten free) carb infusion, I love white rice. *Actually, many Paleo Powers That Be have embraced white rice in the last year or two, so I’m not alone here. 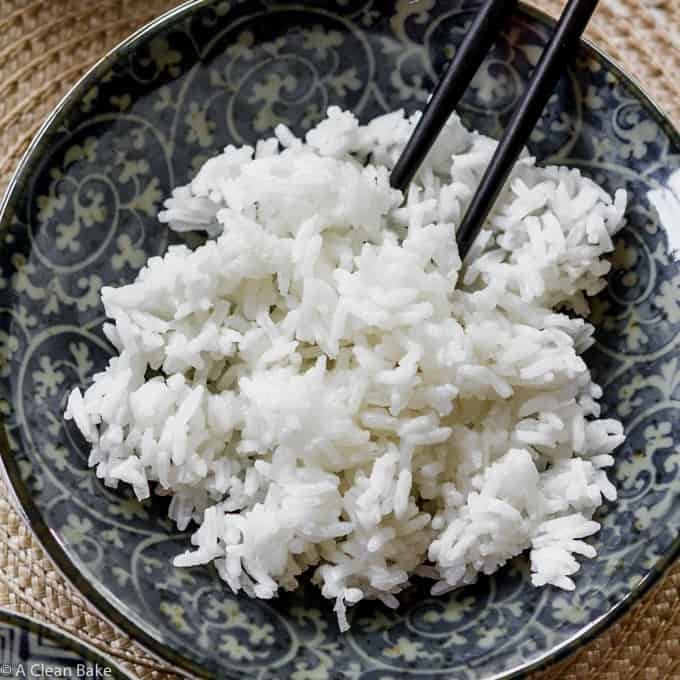 The only problem – with any rice (besides rumblings of arsenic in it, which are much lower in white rice than brown, and lower still if you buy Asian-grown rice vs. US-grown. Not that you should be worried about arsenic in your rice, but I understand that some of you may be.) – is the time it takes to cook. I have this strange memory from childhood of my parents cooking rice slowly, over low heat, very carefully, stirring almost constantly. When I make rice on the stove top, I tend not to have that kind of patience and end up with an unevenly cooked, possible-slightly-burned-but-I’m-not-admitting-to-anything batch. Which brings me to yet another love letter to my slow cooker. And if you cook your rice in the slow cooker, it doesn’t burn or cook unevenly the way it does on the stove. I’m sure there’s some very rational explanation about the heat distribution or something, but all I care about is that I can make a big batch of rice with almost no effort. Plus, using your slow cooker saves you the trouble of having to buy and store a rice cooker. I have a small, city kitchen with limited storage space, so I try to rely on as few gadgets as possible! It takes a little bit of effort, but it is worth it! Rinsing your rice thoroughly before cooking removes excess starch, allowing the rice to cook up into tender, fluffy individual grains. 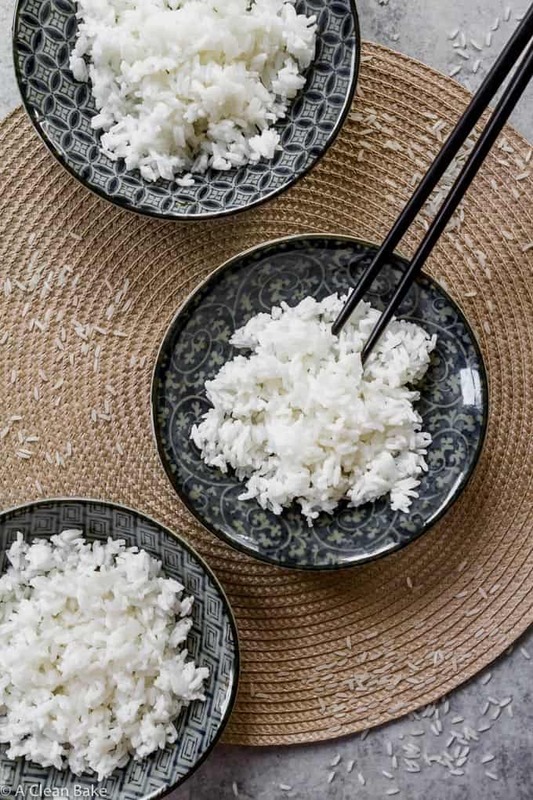 If you skip the rinse, that excess starch clinging to the grains will cause your rice to stick together in one big clump, creating a final product that resembles rice pudding more than the fluffy base or side dish you were going for. 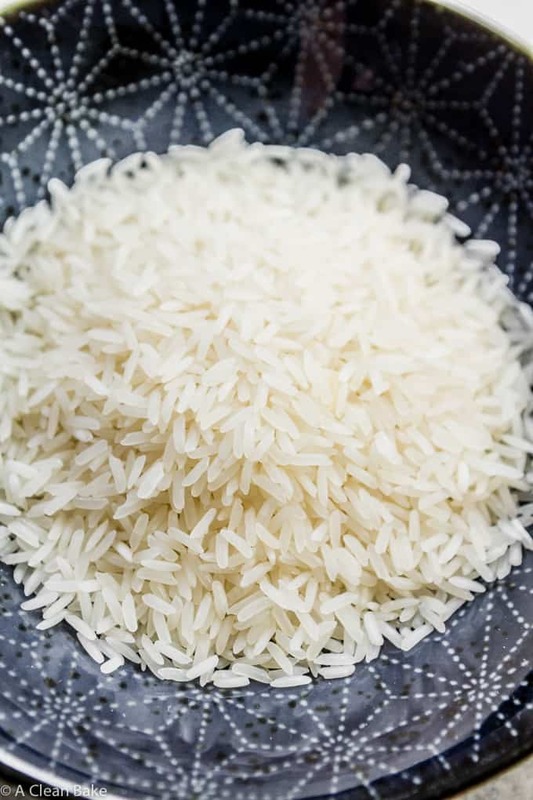 So take those few extra minutes to rinse the rice before you throw it in the slow cooker with the water, walk away and return to batch of perfect rice. This method works for wild rice or brown rice too. Add scant 3 cups water and a pinch of salt for every 1 cup of (rinsed) wild or brown rice. Cook on low 2.5 – 3 hours until water is absorbed, and the grains have burst and are tender. Fluff with a fork, then serve. If you have trouble tolerating brown rice, you may want to try sprouted brown rice. The sprouting step breaks down the outer husk, producing an easier-to-digest grain, and making some of the nutrients inside more bioavailable (easier for your body to access and use). This is the sprouted brown rice I use, and this is the wild rice I use. And finally, a few readers have asked what size and model slow cooker that I used for this, because it has some bearing on cooking time. This 4-quart model is the one I use. What variety of rice should I use? I’ve found that long grain rice works best for this. 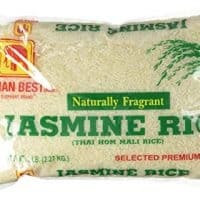 I especially recommend Jasmine or Basmati. As I mentioned above, you can also use brown rice or wild rice. How can I flavor my rice? You can add any seasoning you prefer, to taste. Add it with the raw rice and water, give it a stir, and then cook according to the method below. If you don’t have a particular recipe or cuisine in mind, you can just replace some or all of the water with chicken stock, and add a pinch of garlic powder and/or freshly ground black pepper. That will season the rice without adding any flavors that might clash with your meal. Can I make this a one-pot meal? You mean by adding a protein? Yes, but don’t just wing it. There a plenty of healthy recipes on Google and Pinterest for a slow cooker meal that uses rice as the base and all cooks together. Take your pick! What slow cooker do I use? 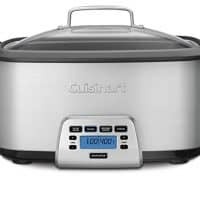 I use this Cuisinart 4-quart multicooker, which also has a high and low slow cook setting, as well as steaming and sautéing settings. I highly recommend it! PS: Check out more slow cooker recipes here! Crockpot rice is my secret to getting dinner on the table with minimal fuss. Making rice in the slow cooker means you'll have half of dinner ready without any effort! Save yourself the time slaving over the stove by making perfect rice in the slow cooker or crockpot. Thoroughly rinse rice in a fine mesh sieve until the runoff turns from cloudy to clear. Place the rinsed rice in the bowl of your slow cooker and sprinkle salt over the top. Pour water over the rice. Cover and cook on low 2-2 1/2 hours until rice is tender. Uncover, fluff rice with a fork, and then serve. This method works for wild rice or brown rice too. Add scant 3 cups water and a pinch of salt for every 1 cup of (rinsed) wild or brown rice. Cook on low 2.5 - 3 hours until water is absorbed, and the grains have burst and are tender. Fluff with a fork, then serve. I definitely think there is an argument to be made for the merits of both white and brown rice, for sure! There is a lot of nutrition in brown rice – for me, I switched to white just because my body doesn’t react well to brown at the moment 🙂 I’ll bet you could use this method for brown rice too, but you’ll probably have to add a bit more water (1/2 – 1 cup) and increase the cooking time (not sure but I’d guess maybe 3-3.5 hours? Just a guess). If you do it, let me know how much water and time it ends up needing! 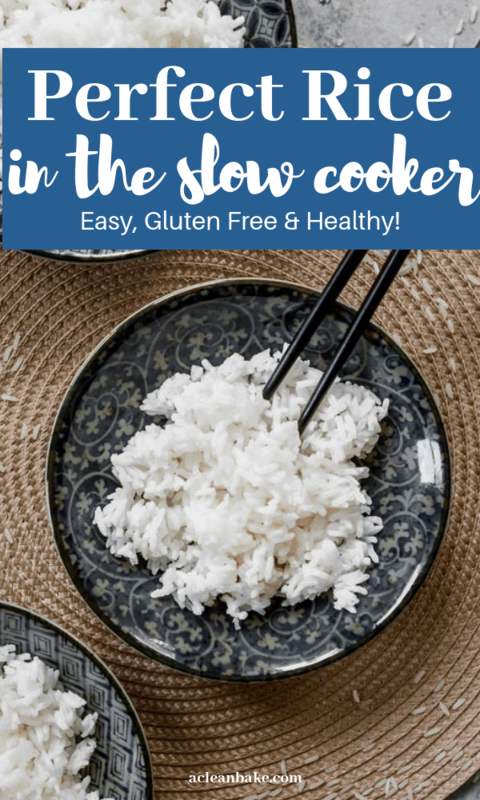 I have a slow cooker but no rice cooker – had no idea I could make rice in it! I usually make rice low and slow and add water, risotto style. That’s only because I never put in the right amount of water the first time! Although it’s great to know that you can make rice in a slow cooker, it’s so much easier on the stove top. Max twenty minutes, not two and a half hours! That’s fair, Hannah, but it’s 2.5 hours of hands-off time when you can be focusing on something else and not babysitting a lit stove! I don’t know about you, but making a big batch at the beginning of the week and being able to worry about one less thing every night is a huge win for me, and probably other busy people. Um, this is brilliant–and is there anything a slow cooker can’t do (it’s my favorite appliance of all time ;)! You’ve betrayed paleo by posting a rice recipe! Lol just kidding; I am 100% on #TeamWhiteRice! I am totally going to try this because my family and I love rice; especially with tacos. What I don’t like about making rice is hovering over the pot waiting for it to be done and I always burn it; I need to try it in the slow cooker. I’m rooting for white rice. Never liked the texture or the flavor of brown rice. However, I do prefer to cook mine in bone broth for an added mineral and nutrient boost. And if I were to soak rice overnight (to release phytic acid), I bet my cooking time in the slow cooker would be cut in half. Will have to try it out. That’s a really great idea! I’ve never thought to try the cooking method with the broth. Thanks for the great tip! Yay! I love white rice; it’s a staple at my home and I’m glad you’ve switched camps 😉 I didn’t know it was possible to cook white rice in the slow cooker but it certainly sounds appealing b/c of the no-work aspect. I certainly would not have the patience in me to cook rice on the stove-top while constantly stirring. Rice cooker, it is! I have heard people cooking rice in the slow cooker but I have never tried it. I’m intrigued by your post and may have to give it try. Did you use a small slow cooker or a 6 quart one? I never make rice on the stove as I can’t be bothered to babysit it and wait for it! Just wondering… I’ve a large Crockpot, now do I cook on the low or high setting? P. S. I prefer brown rice. Love the texture and flavour and as it takes longer to digest, keeps me fuller for longer on a diet. It depends how large is large, but you should still be fine cooking on the low setting. You can also use brown rice if you prefer, but you may need just a bit more water. Me? A novice cook………………I cook for myself and only poisoned me a few times….but I survive. Your slow cooking tips are exactly, almost, what I needed. You might indicate how much of each ingredient to use ie…2 cups chicken broth & 1 cup rice, or, is it the other way around? I threw in 2 chicken sausage links in the 2 cups of chicken broth (in the slow cooker) and let that cook for an hour, or so, then, 1 cup of white rice…lid on and on it’s high setting. …..going to give a taste in an hour, maybe sooner, if the rice is fluffy like you suggested. Tried this with my slow cooker on low . Wasn’t anywhere near cooked at all after two hours . I’m going to try the high setting to finish it off and will try it on high next time from the start . Did you double the recipe? if so you’d need to add extra time. Otherwise, it is possible that my slow cooker temp is higher than yours. What machine were you using?